Zanzibar is an archipelago in the Indian Ocean 22 miles (35 km) off the coast of East Africa, of numerous small islands and two large ones: Unguja (the main island, sometimes informally referred to as 'Zanzibar'), and Pemba Island. The archipelago was once the separate state of Zanzibar, which united with Tanganyika to form Tanzania (derived from the two names), and still enjoys a high degree of autonomy within the union. The capital of Zanzibar, located on the island of Unguja, is Zanzibar City. The city's old quarter, known as Stone Town, is a World Heritage Site. Zanzibar's main industries are spices (which include cloves, nutmeg, cinnamon and pepper), raffia, and tourism. Zanzibar is also the home of the endemic Zanzibar Red Colobus and the elusive Zanzibar Leopard. Zanzibar is sometimes referred to as the "Spice Islands," a term that is also associated with the Maluku Islands in Indonesia. Pemba Island is the only island apart from Zanzibar that still produces cloves on a major basis which is a primary source of spice income for the islands. Sometimes called "a jewel in the lap of Africa," the archipelago has become a popular tourist destination. In 1964 these islands joined with Tanganyika on the mainland to form the United Republic of Tanzania. Zanzibar (Unguja) island, the largest in the archipelago, covers 637 square miles (1,651 square km), while Pemba, the next largest, covers 350 square miles (906 square km). These islands are believed to have once been part of the African continent, having separated during the Miocene (Pemba) and Pliocene (Unguja) epochs. The islands are formed from a base of limestone, which, through time, erosion, and earth movement, have formed a variety of soils such as clays, loams, red earths, and sands. Flat areas of coral limestone also occur. The island of Unguja is low-lying with small ridges along its central north–south axis. Masingini, the highest point of the central ridge system, is 390 feet (119 m) above sea level. The island's higher ground is slightly rolling, giving birth to several small rivers and streams. Believed to have once been covered by dense evergreen forest, what remains are small patches of indigenous forest and isolated large trees. Coconut palms, thicket vegetation and grass are abundant. A tropical, humid climate lends to an annual average rainfall of 60 to 80 inches (1,500 to 2,000 mm), which is consistent and well-distributed throughout the islands. Northeast trade winds blow from December to March and southeast trade winds from May to October. Periods of “long rains” occur from March to May, while “short rains” fall October through December. Agreeable climate and fertile soil give rise to a variety of tropical crops, most importantly the export-crops of cloves and coconuts. Food grown for local consumption include rice, cassava, yams, and tropical fruit. The surrounding waters provide fish, also an important component of the native diet. Fauna include the African pig, civet cat, forest duiker, lemur, leopard (a variety peculiar to Zanzibar), mongoose, two species of monkey, and pigmy antelope. Numerous species of bats and snakes exist. 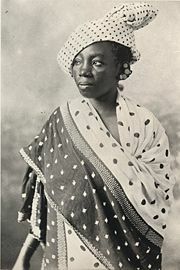 Photograph of woman from Zanzibar by Coutinho brothers, c. 1890. The presence of microlithic tools attests to 20,000 years of human occupation of Zanzibar. The islands became part of the historical record of the wider world when Arab traders discovered them and used them as a base for voyages between Arabia, India, and Africa. 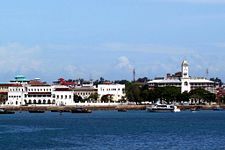 Unguja offered a protected and defensible harbor, so although the archipelago offered few products of value, the Arabs settled at what became Zanzibar City (Stone Town) as a convenient point from which to trade with East African coastal towns. They established garrisons on the islands and built the first mosque in the Southern hemisphere. During the Age of Exploration, the Portuguese Empire was the first European power to gain control of Zanzibar, and kept it for nearly 200 years. In 1698 Zanzibar fell under the control of the Sultanate of Oman, which developed an economy of trade and cash crops, with a ruling Arab elite. Plantations were developed to grow spices, hence the moniker of the Spice Islands (a name also used of Dutch colony the Moluccas, now part of Indonesia). Another major trade good was ivory, the tusks of elephants killed in mainland Africa. The third pillar of the economy was slaves, giving Zanzibar an important place in the Arab slave trade, the Indian Ocean equivalent of the better-known Triangular Trade. Zanzibar City was the main trading port of the East African slave trade, with about 50,000 slaves a year passing through the city. The Sultan of Zanzibar controlled a substantial portion of the East African coast, known as Zanj, which included Mombasa and Dar es Salaam, and trading routes which extended much further inland, such as to Kindu on the Congo River. Flag of the historical Sultanate of Zanzibar. Sometimes gradually, sometimes by fits and starts, control came into the hands of the British Empire; part of the political impetus for this was the nineteenth-century movement for the abolition of the slave trade. The relationship between Britain and the nearest relevant colonial power, Germany, was formalized by the 1890 Helgoland-Zanzibar Treaty, in which Germany pledged not to interfere with British interests in insular Zanzibar. That year, Zanzibar became a protectorate (not a colony) of Britain. From 1890 to 1913, traditional viziers were appointed to govern as puppets, switching to a system of British residents (effectively governors) from 1913 to 1963. The death of one sultan and the succession of another of whom the British did not approve led to the Anglo-Zanzibar War. On the morning of August 27, 1896, ships of the Royal Navy destroyed the Beit al Hukum Palace; a cease fire was declared 45 minutes later, and the bombardment subsequently became known as "The Shortest War in History." The islands gained independence from Britain in December 1963 as a constitutional monarchy. 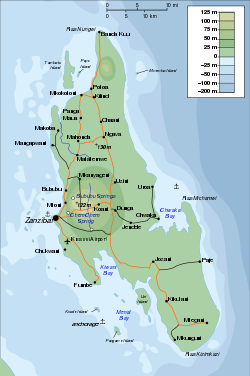 A month later, the bloody Zanzibar Revolution, in which several thousand Arabs and Indians were killed and thousands more expelled, established the Republic of Zanzibar and Pemba. That April, the republic merged with the mainland former colony of Tanganyika, or more accurately, was subsumed by the much larger entity. 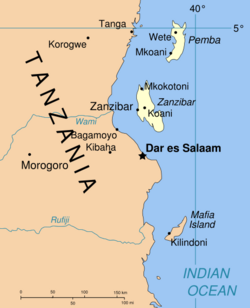 This United Republic of Tanganyika and Zanzibar was soon renamed as a portmanteau, the United Republic of Tanzania, of which Zanzibar remains a semi-autonomous region. The new flag of Zanzibar was hoisted for the first time in January 2005. Although Zanzibar is part of Tanzania, it elects its own president who is head of government for matters internal to the island. It also has its own Revolutionary Council and House of Representatives (with 50 seats, directly elected by universal suffrage to serve five-year terms) to make laws especially for it; these make up the semi-autonomous Revolutionary Government of Zanzibar. The Island of Unguja comprises three administrative regions: Zanzibar Central/South, Zanzibar North and Zanzibar Urban/West. On the Island of Pemba are the two regions Pemba North and Pemba South. Since the early 1990s, the politics of the archipelago have been marked by repeated clashes between two political parties: the Chama Cha Mapinduzi (CCM) and the Civic United Front (CUF). Violence erupted over contested elections in 2000 and 2005, with the CUF claiming both times to have had their rightful victory stolen from them. Following 2005, negotiations between the two parties aiming at the long-term resolution of the tensions as well as a power-sharing accord took place, but suffered repeated setbacks, most notably in April 2008, when the CUF walked away from the negotiating table following a CCM call for a referendum to approve of what had been presented as a done deal on the power-sharing agreement. Prior to the development of eastern African mainland ports, Zanzibar was the trade focus of the region and enjoyed an important entrepôt trade. Pemba Island was once the world's leading clove producer, although when the national government decided to privatize the clove market, the island went into an economic slump. Zanzibar exports spices, seaweed and fine raffia (palms used in textiles and construction). It also has a large fishing and dugout canoe production. Tourism is a major foreign currency earner. Agriculture and fishing are also important aspects of the islands' economy. Zanzibar is a conservative, Sunni Muslim society, although there are also followers of Christianity and Hinduism. Zanzibaris are an eclectic mixture of ethnic backgrounds, indicative of the islands' colorful history. Widespread intermarriage between Shirazis and Africans gave rise to a coastal community with distinctive features, and a language derived in part from Arabic. It is the most common language—a highly Arabicized form of Swahili, known as Kiswahili. Use of pure Arabic is generally confined to scholars and recent arrivals from Arab lands. English is also widely used and understood. Zanzibar was originally populated by Bantu-speaking peoples, the Hadimu and Tumbatu. The earliest arrivals to the islands, they were expropriated during the nineteenth century from the western and more fertile parts of the island by later arrivals, notably Arabs. Its history was influenced by the Arabs, Persians, Indians, Portuguese, British and the African mainland. Stone Town, Zanzibar's capital city, is a place of winding lanes, circular towers, carved wooden doors, raised terraces and beautiful mosques. Named for its many multi-story "stone" buildings, these structures are actually constructed with coral and mortar, not stone. Of the 1,700 "stone" buildings, 1,100 have been classified as having architectural significance. There are 23 "landmark buildings," two cathedrals, over 50 Mosques, 157 balconies, verandahs and loggias and more than 200 carved doors. Zanzibar's Stone Town has been designated a World Heritage Site by UNESCO. Important architectural features are the Livingstone house, the Guliani Bridge, and the House of Wonders. The town of Kidichi features the hammam (Persian baths), built by immigrants from Shiraz, Iran during the reign of Barghash bin Said. According to local legend, the music known as taarab was begun by Sultan Seyyid Barghash bin Said, and rose to prominence in 1928. Influenced by music from cultures with a historical presence in East Africa, including those from East Asia, Sub-Saharan Africa, North Africa, the Middle East and Europe, it began in Zanzibar, and soon spread throughout the region. The word Taarab comes from Arabic, meaning "having joy with music." Zanzibar was the first region in Africa to introduce color television, in 1973. The current TV station is called TvZ. The first television service on mainland Tanzania was not introduced until some twenty years later. ↑ Education in Zanzibar – Southern and Eastern African Consortium for Monitoring Educational Quality. Sacmeq.org. Retrieved January 31, 2012. ↑ Lizzie Williams, Africa Overland (New Holland Publishers, 2005, ISBN 1770071873). ↑ 3.0 3.1 3.2 3.3 Encyclopædia Britannica Online, 2008, Zanzibar Retrieved April 30, 2008. ↑ David Else and Sarah Chanter, Guide to Zanzibar (Chalfont St. Peter, Bucks, England: Bradt, 1993, ISBN 0946983984). ↑ Robert Caputo, October 2001, Swahili Coast, East Africa's Ancient Crossroads National Geographic. Retrieved April 30, 2008. ↑ Rodger Yeager, Tanzania: an African experiment Profiles (Boulder: Westview Press, 1989, ISBN 0813306930), 27. ↑ Zanzibar Unveiled, Islands that lie "like a jewel in the lap of Africa" Retrieved April 30, 2008. ↑ Mohamed El-Mohammady Rizk, Women in Taarab: the performing art in East Africa (Frankfurt am Main: Lang, 2007, ISBN 3631532083). ↑ TvZ. Retrieved January 31, 2012. This page was last modified on 5 July 2013, at 16:02.